Dubai: In what could be an alarming development for Indian carriers, Dubai-based Emirates in 2011-12 flew more international passengers in and out of India than the Indian national carrier, Air India, as per the recently released official data. The statistics reportedly reveal that Emirates garnered 13.04 per cent share of the total Indian market in 2011-12, having flown 4.532 million passengers in and out of the country while Air India and subsidiary Air India Express put together carried 4.138 million passengers in the period, managing just 11.91 per cent share of the market. Emirates, the world’s largest airline by international passengers flown, currently flies 185 flights a week to India via 10 gateways. 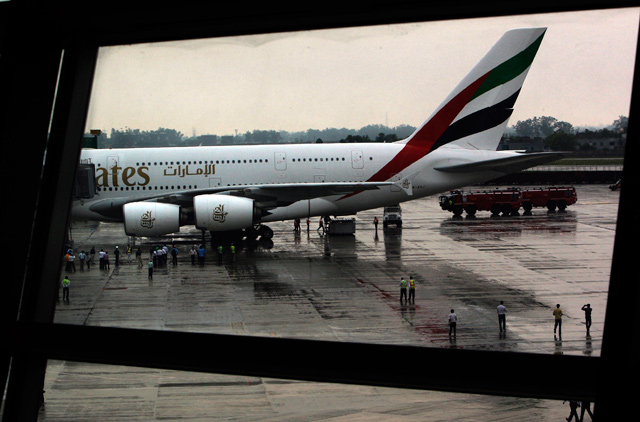 And West Asia and Indian Ocean region, of which India constitutes the largest contributor, accounted for Dh7,083 million in revenue for Emirates in the financial year 2011-2012, representing an 11.5 per cent share for the region within Emirates, an Emirates spokesperson told Gulf News in an emailed statement. The carrier said last year it has contributed $596 million to the Indian economy. “We expect the share of Indian carriers to increase to 30 per cent in two years’ time. If we can get our hub strategy right, it may even cross the 50 per cent mark by 2020,” he added. The other two Gulf carriers — Qatar Airways and Air Arabia — meanwhile, grabbed market shares of 4.41 per cent and 4.31 per cent respectively in the period, according to the data reported. In India, however, Jet Airways had 15.7 per cent market share, followed by Kingfisher Airlines [which was in operations then] with 3.24 per cent share, IndiGo 1.19 per cent, SpiceJet 0.86 per cent and JetLite 0.31 per cent. “This outcome was inevitable. It is all you would expect from a regulatory regime that denied Indian airlines access to capital, markets and expertise for as long as it did. The more important question is what is India going to do about it? To be competitive, it needs to stop hiding behind protectionism and trade barriers and step out into the light,” said analyst Andrew Charlton of Aviation Advocacy.